Mark has worked in Formula One for almost 30 years and has spent the last 15 working as senior executive within the management of Jordan Grand Prix, Red Bull Racing and Cosworth. While operating at the centre of this fascinating industry, Mark has worked directly with the world’s top drivers and team owners, giving him privileged understanding of what it takes to be a world class competitor. Mark was Head of Marketing at the highly successful Jordan team over a ten year period, Mark was famously described as “head of making things happen” in Eddie Jordan’s dynamic organisation. 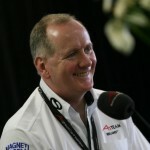 He then joined Jaguar Racing and helped in its transition into the now dominant Red Bull racing team, before taking over responsibility from 2009 to 2011 for the return of Cosworth to Formula One. During his time Mark was responsible for supplying one third of the Formula One teams with engine technology, re-establishing the Cosworth F1 business which has powered 13 Drivers Champions and won 176 Grand Prix – second only to Ferrari. Throughout his career Mark has worked directly with drivers including Michael Schmacher, David Coulthard and Ayrton Senna, and also spent time as part of Jenson Button’s management team. Since 2005 Mark has also co-owned his own racing team, Status Grand Prix based at Silverstone which won the 2009 A1GP World Cup, scored multiple victories in the GP3 series and competes in the Le Man series. Mark’s first book Grand Prix – The Last 25 Years was published in 1991 and his latest book The Business of Winning, which gives businesses and organisations a rare insight into the world of Forumla One and what it takes to build winning teams and compete for success at world level. Mark makes regular appearances in the media and regularly appears on Sky News, Channel 4 News, BBC Radio and Al Jazeera. Mark currently provides expert opinion for ESPN Star Sports’ F1 Coverage which is broadcast in 24 countries in 3 languages.